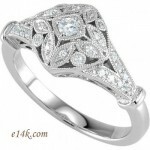 .925 Sterling Silver Round Brilliant Russian CZ Cubic Zirconia Antique Vintage Edwardian Style Right Hand Ring. Beautifully set with several small Round Brilliant accent stones! For a total of 0.75ct. This right hand ring is a perfect Edwardian antique vintage reproduction. These Gorgeous russian CZ is more precisely cut & polished of the best CZ quality available... VERY NICE STONE.. Matching dangle earrings & pendant available. This item is sold out and no longer available.